Today I am going to share my experience with the most raved beauty blender (these days) i.e. the PAC Beauty Blender which is also a dupe of the Original Beauty Blender .. 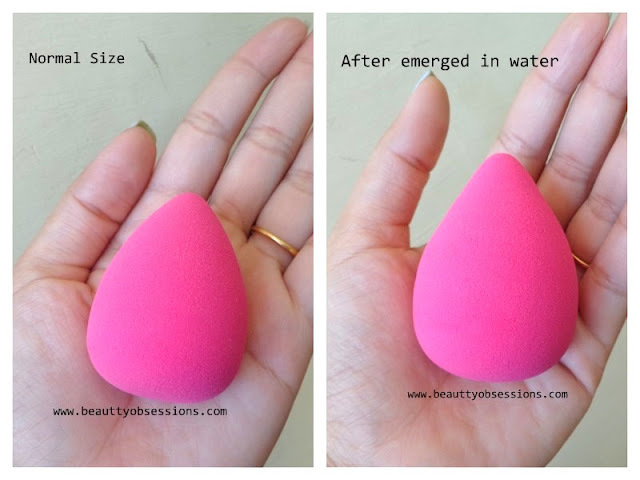 If you are a beginner in makeup and no idea regarding beauty blender,then I am telling you first what is that tiny sponge actually and how it works..?? Beauty Blender is a sponge which can be use to blend foundation,concealer,cream blushes,etc.. and we can only blend the liquid makeup product with this sponge and it works like magic in blending all these.. I have used brushes and sometimes fingers to blend my foundation but after applying this I am in love with beauty blender.. This tiny sponge actually does miracle to makeup.. The original beauty blender is costing a bomb, approx 1800/- or more which is really high and everybody can't afford that.. But don't worry,we have the dupe here.. The PAC beauty blender is very similar to the Original one in both look and performance wise.. I haven't the original one and I don't think I will buy that anymore because there are so many dupes from other brands available in market at lower price tag like the real technique miracle sponge, forever21 beauty blender, PAC beauty blender,etc.. These days the brand PAC is very popular among beauty bloggers and vloggers because of its affordable and quality makeup stuffs. After reading some good reviews ,I thought to give a try to this beauty blender by PAC .. This one is my first PAC product .. Till now I have used it 3 times and my experience is here ..
About The Brand : PAC stands for Professional Artist Cosmetics and is a Korean based company. They made makeup products with a professional touch. So many professional artists use PAC products.. They have makeup brushes with high quality designs, eye liners , lip pencil, lip pots,eye lashes,beauty blender,etc.. The PAC products are available at Amazon, Flipkart and at their own (PAC) website..
Packaging : The beauty blender comes inside a hard cardboard box which is really cute and very sturdy. You can store the beauty blender inside it forever.. It has some informations like price and other details at the back side of the box. All and all I like the packaging ..
My Experience : Oh my God.. this tiny pink egg sponge is so so soft to feel.. I can say the softest ever sponge I have touched so far.. It looks so cute.. One side of the sponge is curvy and wide and other side is pointed..
Ok.. first you have to know that ,what is the proper way to use a beauty blender, so I am telling you the way I use.. I emerged the beauty blender in water for 10-15 seconds and see it increased its size,then I squeezed it to remove the excess water,now I soaked again for 5 seconds and squeezed it again and finally it became double its size and it is ready to use..
Then I made dots of my foundation on my face and just dab beauty blender to blend the foundation out .. and voila.. it worked like charm.. I normally use the wide rounded side to blend my foundation while the pointed side to blend my concealer at the corner of my eyes,nose.. It blends out my foundation and concealer within seconds and makeup done.. It gives a nice dewy finish with natural touch to my face.. I am so impressed with the result..
Now it's time to clean the beauty blender which should be done in carefully .. I have heard that the beauty blender get tear after the first wash only.. I wash it with a baby shampoo.. I take a little shampoo on the beauty blender and rub it gently ,then wash with water . now again I wash under tap water and while washing under tap I squeeze it again and again just to remove the dirty water. I do wash my beauty blender after each use.. Then let it dry for a whole day.. Do place it in an open air area and wait till it completely dry otherwise the sponge will form fungus inside it.. After getting dry it will return to its original size again and do fit inside the box. The main thing is to be noted that , you have to be very gentle while squeezing the beauty blender,as it is very soft.. If you have long nails ,then don't squeeze with your finger,the beauty blender may tear or holes may happen which tends to tear in future. Do squeeze in between your palms .. I did a mistake that I squeezed with my fingers and my beauty blender has now some small holes due to my long nails.. 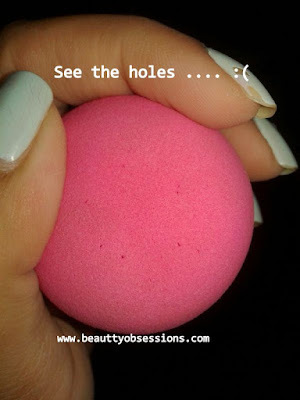 Even after wash properly you may find some stains are still there and that is normal..
That's all for this tiny little pink sponge.. PAC has some more beauty blenders like small sponges at very affordable price.. Those small ones are looking similar to the normal beauty blender and works the same as well.. Pack of four small beauty blenders will cost you 285/- and pack of two costs 150/- .. Isn't it amazing..?? I love their collections, do check out.. I have the angular brush from PAC and I will review that soon after few uses.. Recommendation: Beauty blender is actually a miracle sponge .. As the Original one is very expensive , you can give this a try due to its affordable price tag. To be very honest ,after the the first wash when I see holes on my beauty blender (which happened due to my own fault ) ,I was like I wasted my money on this.. But now I can say if you will take proper care while washing and using,this will stay for a long time without and damage. So all beauty and makeup lovers,do give it a try,I am sure you gonna love it a lot..
Hope you liked this post .. Do share your feedback in the comment below.. Thank you swathi.. I too want to buy the tiny ones..
Well written...adding this to my wishlist asap! I've tried the original beauty blender and I love it. This one from PAC cosmetics definitely sounds good. Yes do try.. Which one you use madhu..
this is currently on my testing table..so far loving it..
Me too.. Thank you for visiting here.. I love it ! Heard a lot about it and would love to give it a try in future ! Nice review ! Thank you baby.. Yes do try.. This seems affordable dupe of beauty blender in the market. Seems like good dupe of beauty blender, but really hate the tearing of it. Sounds good. I want to try mini ones.